Where do think Europe’s biggest Corporate Innovation Challenge is taking place? London? Berlin? Or maybe in Paris? Nope, we are sorry, but this time Vienna is up on top and taking a huge step towards stronger Corporate Startup Engagement (CSE). Last Friday, season 2 of the “Innovation to Company”-Challenge kicked off, aiming to merge the innovation strength of startups, with international networks, strong market positions and the financial power of large corporations. Working with startups is very beneficial for corporates, far beyond generating a fast and promising innovation flow. 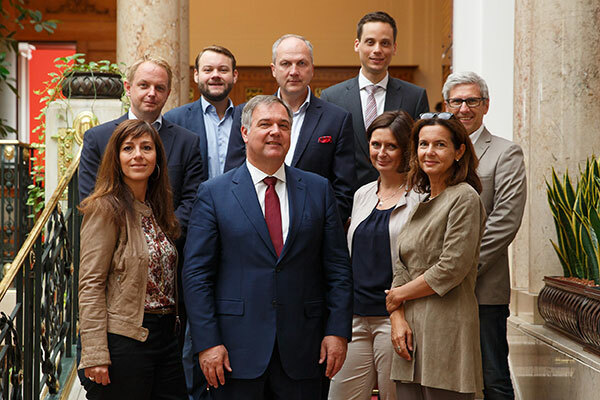 We are proud to plan an important role in this initiative, launched by the Vienna Chamber of Commerce, as we are going to scout and analyse the best startups for all seven challenges. Together with excellent mentors, we will actively consult the corporates and startups in order to bring those together who have the best synergies and have the potential to bring the most value for both sides. We are happy to accept your applications for the competitive challenges of Austrian Telecom (A1), Accor Hotels (Austria), Microsoft (Austria), New Frontier Group, Raiffeisen Zentralbank Österreich AG (RZB Group), Österreichische Post AG and Verbund AG. How does Innovation to Company work? If you’re interested in participating, please go to www.innovation2company.wien. You will find detailed descriptions of tasks and rewards offered for the winner of each challenge. If you decide to apply, your data will be processed by our analysts using the professional software solution of dealmatrix.io. Our team will analyse each and every application carefully and will contact the most promising applicants to learn more and dive even deeper into your business cases. Each challenge will bring out three finalists. Those who make the cut and are invited to meet the corporates will get a chance to pitch and negotiate a potential collaboration, an investment or similar rewards (see challenge description for details). During the whole process experienced coaches such as Martin Giesswein (Digital City Vienna), Berthold Baurek-Karlic (Managing Partner, Venionaire Capital) and Lorenz Edtmayer (Tailored Media and derbrutkasten.com) guide and support the process between all corporates and startups. All finalists will receive individual pitch training and mentoring sessions in order to land a perfect pitch. Finally, the corporates pick the winners, which will receive their prizes on November at the Mercur Innovation Awards. “This is a great chance for European startups especially the finalists and winners, as they will have the chance to access global markets, through extremely strong strategic partners and their well established corporate and partnership networks worldwide”, explains Berthold Baurek-Karlic.